FPSO Market size was valued over USD 25 billion in 2018 with annual oil production capacity set to exceed 1.3 million barrels per day (BOPD) by 2025. FPSO market size will witness robust growth on account of growing investments toward offshore exploration and development activities along with advancing deep water technologies. According to International Energy Agency (IEA), annual capital spending toward offshore oil & gas production activities will reach USD 60 billion by 2040 in Brazil alone. Furthermore, depleting onshore oil reserves along with associated high infrastructure development cost will favor the deployment of FPSOs as an alternative. The ability of these units to economically accelerate the procurement of oil & gas will boost their deployment over the coming years. Growing number of discoveries and exploitation of marginal oil reserves at remote offshore locations coupled with the ability of FPSOs to function without a fixed structure support will positively influence the market growth. For instance, in August 2018, an oil field was discovered in North Western Shelf of Australia with an estimated reserve of over 170 million barrels of oil. In addition, ability of these units to be redeployed to a different oil field followed by exhaustion of one field, along with immunity to harsh weather conditions will further propel their deployment. Converted FPSO market size, in 2018 recorded an annual deployment of 7 units. Relatively lower capex, shorter construction schedule and enhanced flexibility are some of the key parameters that will accelerate the vessel deployment. Moreover, the minimal use of resources associated with the conversion coupled with ease of availability of retired FPSOs and oil tankers will further complement the business growth. The capital expenditure of a converted FPSO is approximately one third of that of a new built vessel of comparable specifications. New built FPSO market size will witness growth on account of positive outlook toward deep and ultra-deep water exploration and production activities. Lower operating cost, flexibility for field life extension and optimal design in conjunction with modern safety features are some of the factors that will augment the product adoption. Furthermore, advancements in offshore technologies, including the introduction of cylindrical hull designs, double hull design and separable turret will continue to attract investors across the oil & gas sector. However, longer project schedules and much higher capital expenditure may hamper the deployment of new built units. 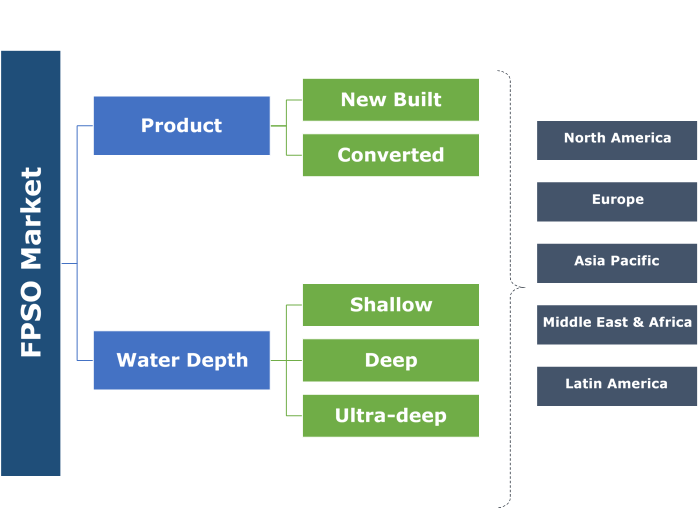 Shallow depth FPSOs in 2018, accounted for over 15% of the global market capex share. Proximity to onshore support and easy transfer of processed hydrocarbons are the prime factors that will propel the product demand. However, susceptibility to bad weather, higher risk of rollover and low level of damping will offer resistance to these projects. Shifting trends toward ultra-deep exploration activities and advancing seismic and drilling technologies along with availability of larger oil reserves in deeper basins will drive the ultra-deep FPSO market size. As per the U.S. Energy Information Administration (EIA), Brazil has increased oil production from ultra-deep water from 1.3 million barrels per day in 2005 to 2.2 million barrels per day in 2015. 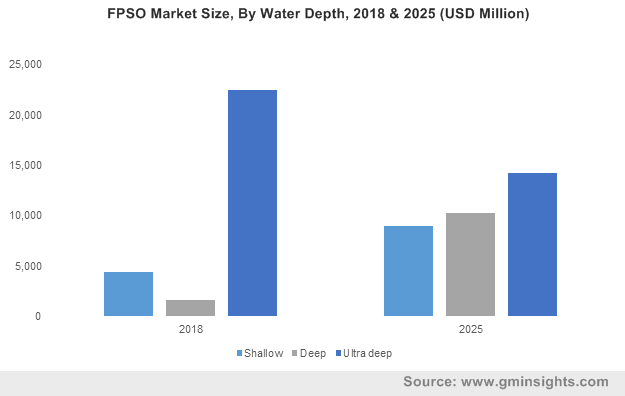 Increased capital spending by oil & gas companies toward exploration and development of deep-water projects along with depleting onshore and shallow water oil fields will drive the deep-water FPSO market growth. Latin America market capex, in 2018 was valued over USD 18 billion. Discovery of vast oil reserves in pre salt geological layers along with favorable government policies and growing investments will boost the industry growth. According to Petrobras, Santos and Campos basins of Brazil contain over 16 billion barrels of pre-salt oil reserves. Moreover, the introduction of new local content regulations in Brazil, implying simpler & lower requirements with reduced fines for E&P contracts will effectively boost the deployment of FPSOs in the country. The Europe market growth is largely driven by new project implementations in the UK and Norway. The market expansion is largely attributed to the region’s stringent commitment to emission reduction targets and growing significance of diversifying energy supplies. The Middle East & African market is characterized by large capacity new-build and highly customized vessels, adequate for oil fields located in deep and ultra-deep waters primarily across the offshore regions of Nigeria, Angola and Ghana. Furthermore, a multitude of relatively lower-capex floating solutions appropriate for the shallower oil fields and comparably less severe weather conditions prevalent in the region will drive the Asia Pacific FPSO market growth. Key players operating in the global market include Bumi Armada, BW Offshore, CNOOC, MODEC, SBM Offshore, Woodside Petroleum, Petrobras, DSME, Hyundai Heavy Industries, Samsung Heavy Industries, KBR, Saipem and Technip amongst others. Floating Production Storage and Offloading (FPSO) vessels are offshore production units that comprise hydrocarbon processing equipment and storage facility for oil and gas on a single platform. The basic design of an FPSO incorporates a floating vessel, comprising processing equipment, known as topsides, aboard the vessel's deck and storage facility below in the hull. An FPSO, post processing, stores the product before offloading it periodically to shuttle tankers or transport the processed hydrocarbons via subsea pipeline infrastructure. Depleting onshore oil reserves and growing offshore exploration activities will favor the product adoption over the forecast timeframe.